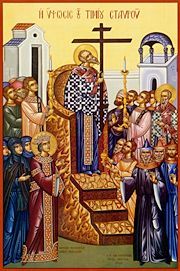 The Elevation of the Holy Cross is one of the Great Feasts of the Orthodox Church, celebrated on September 14. This feast is also referred to as the Exaltation of the Cross. This is also a popular name day for Stavroula/Stavros (from "stavros" meaning cross). The finding of the Cross by the Empress Helen (the mother of St. Constantine the Great) on Golgotha in 326 AD, the place where Christ was crucified. On the spot where the Cross was discovered, St. Helen had found a hitherto unknown flower of rare beauty and fragrance, which has been named "Vasiliko," or Basil, meaning the flower of royalty. Note that the word "Vasiliko" means "of the King," since the word "Basileus" in Greek means "King"; so, the plant Vasiliko, Basil, is tied to the Precious Cross of the King of Glory, our Lord Jesus Christ. Underneath the Basil, the Cross of Christ was found, but with it were the other two crosses, those used to crucify the two thieves on either side of Christ. The sign with the inscription, "Jesus of Nazareth, the King of the Jews", also lay among the three crosses. In order to determine which one was the true cross, a sick woman was told to kiss each of the three crosses. The woman kissed the first cross with no result. She kissed the second cross and again nothing happened. However, when the ailing woman kissed the True Cross, she was immediately made well. It so happened that a funeral procession was passing that way, and so the body of the dead man was placed on each of the crosses, and when it was placed on the True Cross, the dead man came to life — thus the name the “Life-Giving” Cross, which gives life not only to that man, but to each person who believes in the sacrifice of Christ on the Cross and His all-glorious three day Resurrection. When the true Cross was identified, it was lifted on high for all the people to see, who then continually sang Kyrie eleison, a practice which is still enacted at current celebrations of this feast. The recovery of the Cross on which Jesus Christ was crucified from the Persians. The Persians had captured the True Cross as a prize of war when they sacked Jerusalem in 614 AD. It was recovered by the forces of the Byzantine Empire (Eastern Roman Empire) in 627 AD, when Emperor Heraclius decisively defeated the Sassanid Persians at The Battle of Nineveh, surrounding their capital Ctesiphon, recovering the True Cross, and breaking the power of the Sassanid dynasty. The Elevation took place on March 21, 630 AD, when Emperor Heraclius entered Jerusalem amidst great rejoicing, and together with Patriarch Zacharios (609-632), transferred the Cross of Christ with great solemnity into the temple of the Resurrection, joyously held up for veneration by the Christian faithful. This is one of the two feast days which is held as a strict fast. The other is the commemoration of the Beheading of St. John the Forerunner on August 29. This is a holy day of fasting and repentance. On this day the faithful make dedication to the crucified Lord and pledge their faithfulness to him by making prostrations at the Lords feet on the life creating Cross. For the feast, the Cross is placed on a tray surrounded by flowers or branches of basil, and placed in the center of the Church for veneration. On the eve of the feast, Vespers is served and contains three Old Testament readings. The first, from Exodus 15:22-16:1, tells of the "tree" which made the bitter waters sweet, the symbol of the Tree of the Cross. The second reading is from Proverbs 3:11-18, which reminds us that the Lord chastens and corrects those whom he loves and that Divine Wisdom is "a Tree of life to those who lay hold upon her and trust in her, as in the Lord." The third reading is from the Prophecy of Isaiah 60:11-16; it tells of the "city of the Lord" where both Jews and Gentiles will live together and shall prostrate themselves at the place of God's feet and "shall know that I, the Lord, am your Savior and your Redeemer, the mighty One of Jacob." Sometimes Matins is served on the morning of the feast. The four directions of the universe are blessed with the Cross, while the faithful repeat the chant "Lord have mercy." The Matins Gospel reading is from John 12:28-36. In it Christ says that when he is elevated on the Cross he will draw all men to himself. Divine Liturgy is served on the day on the feast. The normal antiphons are replaced by special verses from the psalms 22, 74, and 99, which have direct reference to Christ's crucifixion on the Cross. A special hymn replaces the Trisagion hymn, as it is sung, the faithful prostrate. The epistle reading is from I Corinthians 1:18-24, and says that "the message of the cross is foolishness to those who are perishing, but to us who are being saved it is the power of God." The gospel reading is taken from John 19:6-11, 13-20, 25-28, and 30-35 together. This long reading is the passion account. In the Ethiopian Orthodox Church, this feast (called Mesqel) is the most significant feast-day after Pascha and Christmas. The faithful light bonfires to commemorate St. Helen's bonfire that revealed the Holy Cross, and burn daisies to symbolize the incense that descended upon the location of the Cross. By bestowing on them the Invincible trophy, Your weapon of Peace. F.C. Conybeare. Antiochus Strategos, The Capture of Jerusalem by the Persians in 614 AD. English Historical Review 25 (1910) pp. 502-517. This page was last edited on September 13, 2015, at 05:47. This page has been accessed 104,228 times.